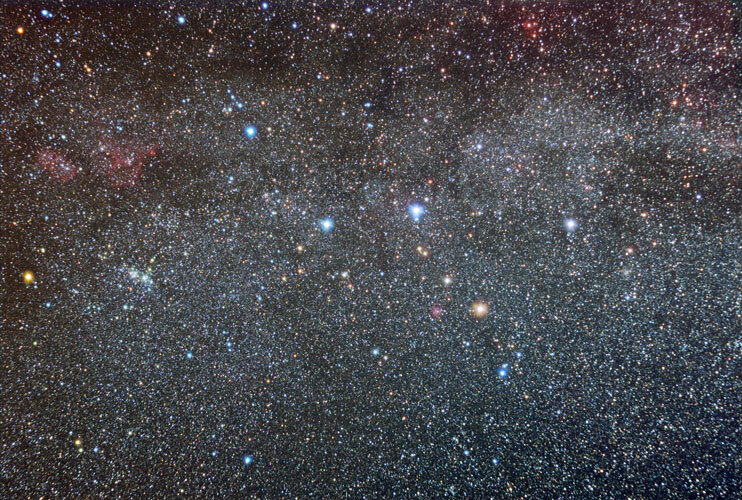 Cassiopeia, named for the legendary queen of Ethiopia, is one of the two bright circumpolar constellations visible from mid-northern latitudes, along with Ursa Major. North is at the top in this image. The red nebulosity of NGC 281 can be seen left (east) of Alpha Cassiopeia. IC 1848 and IC 1805 are the red emission nebulae near the left edge of the frame. Below IC 1805 is the Double Cluster in Perseus. Technical Notes: A diffusion filter was used for three exposures for each channel. Separate LRGB composites were created for the unfiltered and filtered images. The LRGB images were blended using the Lighten function in Photoshop CS2.